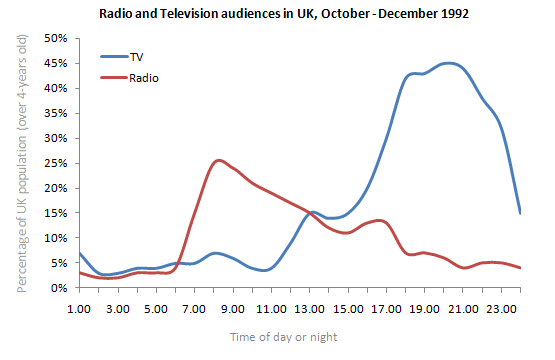 The graph shows the percentage of audiences over 4 yes old of UK follows the radio and television throughout the day during the period October-December 1992. It has been observed from the graph that less than 10% audiences follows the radio at 6:00 am and the percentage raised to a pick around 30% at 8′AM and decline gradually to around 10% during the period 2′00 to 4′00 Pm and again raised a bi t to around 12% between 4′00 to 6′00 PM. It then again dropped to below 10% at around 10′PM. The rate again raised to a bit between 10′00 PM to 12′00 PM and then dropped slowly by 4′00 AM. On the other hand, the rate of television audiences raises 0-10% during the period 6′00 to 8′00 am and remain steady up to 1 0′AM and then gradually goes down by 12′00 noon. The percentage raised dramatically to around 15% by 2′00 noon. The percentage raised dramatically goes down by 12′00 noon. The percentage raised dramatically to around 15% by 2′00 PM which again raised to a pick above 40% between 6′00-8′00 PM and then gradually dropped between the period 12′00 PM to 4′00 AM. The blue graph shows the television audiences throughout the day. It shows that the percentage of audiences is three percent in early morning but it gradually rises unto ten percent at 8:00 am and maintains the same for the next two hours. There is a slight fall in percentage in next two hours however after that it raises sharp unto twenty percent within the next two hours. After this the graph rises very fast and attains its peak at 10 pm which is about forty five percent. The graph gradually falls down and at 2:00 am it is at five percent. The red graph shows the percentage for radio audiences. Unlike the television one the peak percentage of the radio audiences is at 8:00 am which is about 30 percent. Then it gradually falls and it corresponds with the television one at two pm. After that it gradually falls but with a small increase in percentage at 4:30 to 6:00 pm. The percentage of audience then gradually goes down and at four AM it is the lowest which is near 2 percent. These graphs prove the progressive popularity of television.